Recyclable wastes are generated by every student and staff member at UMass. Each staff member is provided with a blue or green Rubbermaid bin in which to store bottles, cans and paper (single stream) recycling. These bins are emptied once to twice per week by custodians in the academic and administrative offices - as well as in labs and classrooms across campus. 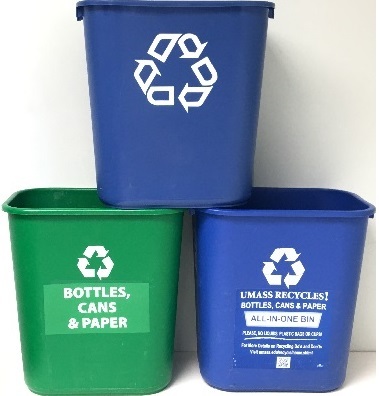 If you are a staff member looking to recycle your waste and: (a) didn’t get recycling pickup, or, (b) are missing a recycling bin – you may contact: Custodial Services at 545-0200 to obtain assistance from your area custodial supervisor. If you are a student living in a campus residence hall, your room is provided with a black (or beige) trash bin and a blue recycling bin to use for storage of your single stream recycling. Except in a few smaller living areas, each floor of your residence hall has a Waste Room/Closet where you may deposit your bottles, cans and paper recycling. Students living in Central, Northeast and North Apts must carry their trash and recyclables to a collection point or enclosure on the exterior of the building. Campus dining commons have been provided with recycling containers on their loading docks. 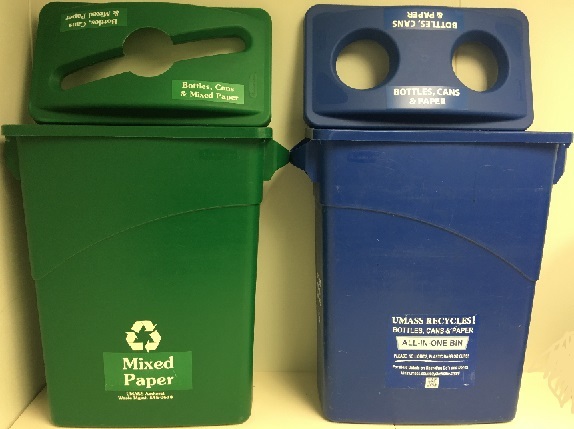 The details on which materials can be placed in the single stream bins are explained on Recycle Bottles, Cans and Paper but are also visible in the form of bookmarks and recycling guidelines that have been distributed or posted throughout the campus.